Earlier this month, NOAA provided a list of “pirate fishing” countries to Congress. This report identifies Portugal, Italy, Venezuela, Colombia, Ecuador, and Panama as nations whose vessels engage in “illegal, unreported, unregulated” fishing. According to the Magnuson-Stevens act, one of the most important laws addressing U.S. fisheries policy, these nations now have to “consult” with NOAA to end their pirate fishing. If they do not, they could face severe economic sanctions. Vessels flying the flag of the violator country could be denied entry into U.S. ports, or imports from that country could be restricted. Personally, I don’t think that Hugo Chavez would care very much if we stopped importing Venezuelan fish, and I can’t imagine us implementing sanctions against an important ally like Italy over a fishing disagreement. 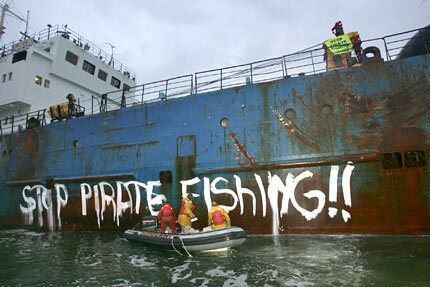 Still, it’s nice to see illegal fishing being taken seriously by the government. It’s worth noting that at least some previously-identified violators has changed their ways. France, China, Libya, and Tunisia all either punished the owners of the ships in question or altered national fisheries laws to address pirate fishing. I’ll follow this story closely, since the outcome will go a long way towards determining whether the United States is a global leader on fisheries and marine conservation issues. Stay tuned. Agreed, pirate fishing is definitely not as awesome as I imagined – sailing vessels, puffy shirts, funny hats, and fishing rods! Definitely a major problem, but I guess one could hope that the current violators change their ways like China and France did. Thanks for this post. I noticed, however, a couple things for correction wrt IUU statistics. Pew and NOAA have not conducted their own studies, though they both work actively on IUU fishing. Both of their estimates are taken from Agnew et al. 2009. Estimating the Worldwide Extent of Illegal Fishing. It is an open access article, available here at PLoSONE. Yes, the NYT Green Blog also recently attributed this statistic to Pew, which was incorrect. Thanks for the information, Mark. I’ll look into it and if you are correct I’ll update the post. I’d be happy to give more detail on this. Shoot me an email if you want. Best. Please do. WhySharksMatter AT Gmail DOT com. Thanks, Mark! Yeah, that’s about as un-awesome as “ghost fishing,” which also sounded pretty cool until I heard the definition. We may not have much leverage with Chavez, but I expect the other countries on the list will take notice. Heck, even Venezuela might get with the program if we start slapping their non-fish imports with hefty tariffs. Except for their oil, of course – we’re kind of addicted to that.